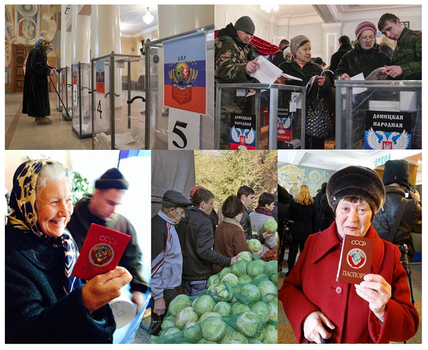 On November 2, 2014, residents of the Donetsk and Luhansk regions in Eastern Ukraine held illegitimate elections, under the watchful eye of Russia-funded militants. The proceedings had all the earmarks of the Putin chapiteau that led up to the annexation of Crimea. Diehard fans of the USSR lined up to receive free cabbage and other cheap vegetables on their way to the polls. Free cabbage got the participants so worked up, they managed to produce 100.1% of votes for the candidates. Afterwards, they gathered to celebrate pseudo-elections in classic Soviet fashion, with music, free food and burly gunmen. Ukraine’s Western allies see the vote as another step toward a long-term frozen conflict, which will be used by Russia to exert pressure on Ukraine, as it has done in Georgia and Moldova. Transdniestria, Nagorno-Karabakh, Abkhazia and South Ossetia failed to secure any meaningful international recognition, but allowed Russia the opportunity to exert pressure over the central governments. Putin’s piracy expanded to Ukraine, but will most likely continue elsewhere. Ukrainian government and the West have strongly condemned the vote, which violates the terms of a cease-fire agreement signed by Russia, Ukraine and separatist leaders in Minsk, Belarus, in early September, 2014. The peace deal included an agreement that local elections would be held in Donetsk and Luhansk in accordance with Ukrainian laws, in December of this year. This is not the first time Ukraine discovers that deals with rogue nations and the terrorists are not worth the paper they are written on. One-sided cease-fire agreements, callously disregarded by Russia-funded separatists, have already claimed many lives. Kremlin’s mouthpiece, Russia Today, feigned outrage at the fact that Ukrainian authorities have commenced criminal proceedings against the organizers of the unauthorized elections, “despite them being sanctioned by the Minsk peace deal.” This statement is inconsistent with the fact that the Minsk agreement did not “sanction” unconstitutional elections in November. Ahead of Sunday’s vote, President of Ukraine Petro Poroshenko called the polls “pseudo-elections that terrorists and bandits want to organize on occupied territory.” “This farce under the muzzles of tanks and machine guns, which today was held by two terrorist organizations in parts of Donbass, is a terrible event that has nothing to do with the real will of the people,” he added. EU’s new foreign policy chief, Federica Mogherini, said that Brussels will not recognize the results of the illegitimate elections in Eastern Ukraine. Mark Stroh, a spokesperson for the US National Security Council, said that the US will not recognize the quasi-elections, which contravene Ukraine’s constitution and the Minsk protocol signed at the OSCE-mediated talks in early September. This doesn’t bode well for@RT_com: truth seems to get more retweets. Unsurprisingly, Russia Today journalist Paula Slier lied, by publicly claiming that OSCE observers have inspected the polling stations in Eastern Ukraine. Slier later deleted her Tweet, which was nonetheless preserved. Instead of OSCE, an “ASCE” was crudely thrown together as a Bizarro World version of international monitoring. The “Agency for Security and Cooperation in Europe” (imitation crabmeat of the observer kind), is comprised of extreme far-right party “monitors” from Austria, Italy, Hungary and South Ossetia. Having forged close ties with Europe’s far right parties, Putin hypocritically accuses Ukraine of being far-right and fascist. Two of the “ASCE monitors,” Alessandro Musilino of Italy’s far-right Forza Italia and Austrian Ewald Stadler of the far-right Die Reformkonservativen, publicly admitted to illegally entering Eastern Ukraine through a separatist-controlled border crossing from Russia’s Rostov region. Musilino and Stadler were confident that the elections would be free of violations, in spite of the fact that there were no voter lists, but plenty of gunmen. Those are truly the most easygoing “international monitors” any illegitimate elections could hope for. Yet another military convoy of 40+ trucks passing #Khartsyzk toward#Donetsk. With anti-aircraft guns, fighters. As the separatists anxiously await the annexation of the beleaguered region by Russia, the Ukrainian military reports “intensive” movement of Russian troops and equipment pouring in across the border. “There is intensive deployment of military equipment and personnel of the enemy from the territory of the Russian Federation onto territory temporarily controlled by insurgents,” Ukrainian military spokesman Andriy Lysenko said during a press briefing in Kiev. The West can fully expect to hear Putin’s claims that savvy locals simply purchased uniforms, tanks and anti-aircraft missiles at the shop. Top DNR guy from Russia told me a) he hates most of DNR leadership and wishes them dead b) he hopes for similar armed uprising in Russia. In the meantime, the top “leader” of the Donetsk National Republic (DNR) told Shaun Walker of the Guardian that he “hates most of DNR leadership and wishes them dead” and that “he hopes for similar armed uprising in Russia.” Having sown the wind in the Cabbage Republic of Donbass, Putin should be prepared to reap the tempest back at home.